These two fantastic photos are from the Lewis Museum Trust collection held at Stornoway Library. Unfortunately, we have no further information about this band apart from the fact the photos appear to have been taken in the Town Hall. 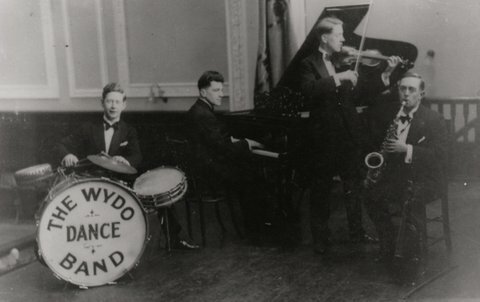 Can you help us and let me know more about this band and the people who played in it?Contact us using tasglann@cne-siar.gov.uk or leave a message below! 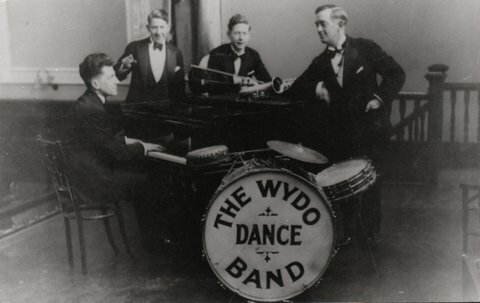 The Wydo Dance Band were a popular group of the 1930’s in and around Stornoway. The second of the two pictures displayed on your blog is well known and was reproduced in ‘A Lewis Album’ published by Acair in 1979. The photographer was Angie the Caley (himself in the picture) whose family ran the old Caledonian Hotel. The Lewis Album book contains many of his own collection. Duncan Morison was a very well known concert pianist who performed all over the world. His father worked as a handyman at the Lews Castle during Major (later Colonel) Duncan Matheson’s time hence young Duncan’s nickname of ‘Major’. His mother was a schoolteacher at Lady Matheson’s female industrial school and Duncan himself lived there for much of his life. He played in front of Hitler during a tour of Germany and was a great favourite of the Queen Mother when she was Duchess of York. He had an aristocratic patron in the form of the Marchioness of Londonberry and often stayed with her in London. He was a music teacher in Lewis during his later years. He was made a Freeman of the Western Isles in 1996 (the ceremony was filmed and is on You Tube!). Duncan (who was also an MBE) died in 1998 aged 92. Many thanks go to Willie for kindly sending us this information! This entry was posted in Uncategorized and tagged Lewis Museum Trust, music, Stornoway Town Hall, The Wydo Dance Band. Bookmark the permalink.